The below tours originate from various pickup locations on the east side of Glacier National Park. Be sure to bring your Park Pass or park entrance receipt on the tour. There are no physical tickets for the tour, so please check in at the Front Desk or Concierge Desk at the property at least 15 minutes prior to the scheduled tour time to ensure an on-time departure. Tour duration and return times are approximate and may vary slightly. The most inclusive tour of Glacier National Park starts with a morning drive over Marias Pass, with wildlife viewing at Goat Lick. After an optional lunch at Lake McDonald Lodge, tour the grand cedar and hemlock forests that lie within the Lake McDonald Valley. Ascend to the high alpine region of the Going-to-the-Sun Road at Logan Pass and down into the St. Mary Valley. Stop at the Wild Goose Island overlook for another incredible photo opportunity. The tour finishes with grand vistas of grassland, prairie and mountains as you arrive back at Glacier Park Lodge. Start the tour on the unique and rugged eastern side of Glacier. Along the way, visit the stunning St. Mary Lake area and historic Rising Sun Motor Inn. Then, travel up the Going-to-the-Sun Road to the Continental Divide and Logan Pass. Take in the infinite splendors and majestic scenery before returning to the flowering valleys and open prairies along the eastern slopes of Glacier National Park. *Evening departures available July 1 through September 2 only. The journey starts on the rugged eastern slopes and follows the glacially carved valleys in the St. Mary region. Proceed into the heart of Glacier National Park on the Going-to-the-Sun Road and to the top of the Continental Divide at Logan Pass. Continue down the west side of the park for an optional lunch* at the historic Lake McDonald Lodge, before heading back. *Please note that lunch at Lake McDonald Lodge is not included in the price of the tour, but there will be time for a break and lunch may be purchased at the property. 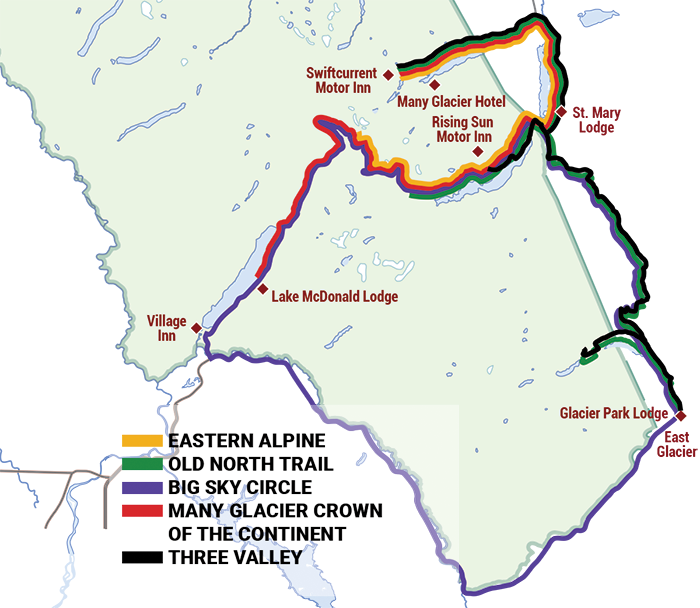 Your journey begins in the glacially clad Swiftcurrent Valley and continues on through St. Mary and over the Hudson Bay Divide on the 10,000 year-old Old North Trail. Traverse through pristine mountain and prairie vistas on your way to an optional lunch at the historic Glacier Park Lodge Great Northern Dining Room. After lunch*, experience Glacier’s “secret” Two Medicine Valley with a short optional stroll to Running Eagle Falls and a stop at the historic Two Medicine Camp Store. Return to Many Glacier Valley after a short stop at the picturesque Wild Goose Island overlook on Going-to-the-Sun Road. *Please note that lunch at Glacier Park Lodge is not included in the price of the tour, but there will be time for a break and lunch may be purchased at the property. The Three Valley Tour consists of the three valleys along the eastern edge of Glacier National Park. You will discover the majestic peaks of the St. Mary Valley, including a ride up Going-to-the-Sun Road; an awe-inspiring journey into Swiftcurrent Valley, with some of the best glacier views from the road; and, for those who start from Glacier Park Lodge, the trip concludes by experiencing the quiet grandeur of the Two Medicine Valley. Expect to have your breath taken away by the sights you will encounter, as well as an excellent opportunity to see three of the remaining glaciers in the park.